Those tranquil waterways look even more appealing now as summer temperatures soar and the tree-lined banks offer shade and relaxation. 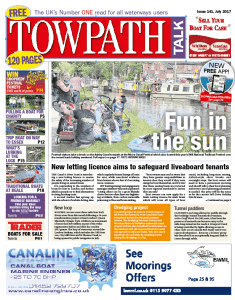 Why not add to that sense of calm and well-being by diving into your latest issue of Towpath Talk? The July issue is now available, and you can either collect a 120-page copy of your favourite waterways newspaper from chandleries or other outlets or, if you have a suitable smartphone or tablet, you can catch up with Towpath’s contents on your mobile device. So, what’s in store, whichever way you like to digest your news? 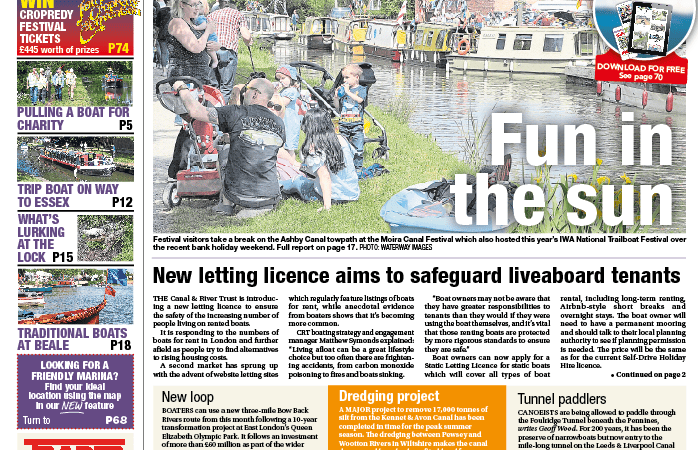 There’s an important report on the front page in which the Canal & River Trust outlines its plans for a new letting licence to ensure the safety of the increasing number of people living on rented boats. As we’re reaching the height of the cruising season, there’s timely advice from the Royal Yachting Association about how to stay safe when operating and travelling through locks. And staying on the theme of responsible boating, Derek Stansfield, director of training for the National Community Boats Association, gives details of training courses for novice boaters. But it’s not all about the serious stuff – check out our packed pages for news and views from across the waterways spectrum. For example, if you go down to the riverside at Abingdon Lock you’ll be sure of a big surprise in the shape of a crocodile, mouth agape, waiting to greet visitors. But no one’s in danger as, like many other animals at the lock, he’s just carved from wood! Continuing the craft-based theme, arty folk in Whitchurch-on-Thames have created a gallery of ‘yarn art’, which stretches across the toll bridge and its approach road. A host of summer shows have already taken place, and we have reports from several of them including Crick, Moira Canal Festival and Beale Boat and Outdoor Show. We’re also looking ahead to other summer events, reviewing some excellent waterways-based books, and there are ideas for places to visit or stay. If you’re thinking of buying your own boat, we have advertisers galore, and you can browse hundreds of craft in a variety of sizes and prices from the comfort of your armchair – or your sun lounger, if you prefer. So if the holiday habit has well and truly grabbed you, and you fancy dipping a toe into the beautiful world of the waterways, you can find out everything you need to know from Towpath Talk!